A great mystery was set in motion a few years ago when a spacecraft designed to measure gamma-ray bursts - the most powerful explosions in the Universe - found that Earth was actually emitting some flashes of its own. Artist's conception of lightning strikes above the clouds triggering gamma-ray bursts. The red spark is a red sprite, blue jets are the short ones, and the TGF is the purple flash. Click on image for animation or download broadcast quality animation or print resolution still. (No audio) Credit: NASA. Named Terrestrial gamma-ray flashes (TGFs), these very short blasts of gamma rays lasting about one millisecond, are emitted into space from Earth's upper atmosphere. Scientists believe electrons traveling at nearly the speed of light scatter off of atoms and decelerate in the upper atmosphere, emitting the TGFs. Red areas are regions that receive a lot of lightning, as recorded by satellites, while the flashes are individual TGFs observed by RHESSI. Note that the TGFs occur more frequently in regions with higher lightning probability. Click on image for animation or download broadcast quality animation. (No audio) Credit: NASA/NASDA. The Burst and Transient Source Experiment (BATSE) on the Compton Gamma-Ray Observatory discovered TGFs in 1994, but was limited in its ability to count them or measure peak energies. New observations from the Reuven Ramaty High Energy Solar Spectroscopic Imager (RHESSI) satellite raise the maximum recorded energy of TGFs by a factor of ten and indicate that the Earth gives off about 50 TGFs every day, and possibly more. "The energies we see are as high as those of gamma rays emitted from black holes and neutron stars," said David Smith, an assistant professor of physics at UC Santa Cruz and author of a scientific paper on this topic. The exact mechanism that accelerates the electron beams to produce TGFs is still uncertain, he said, but it probably involves the build-up of electric charge at the tops of thunderclouds due to lightning discharges. This results in a powerful electric field between the cloudtops and the ionosphere, the outer layer of Earth's atmosphere. 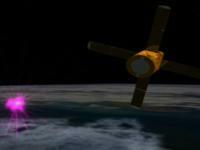 TGFs have been associated with lightning strikes and may be related to red sprites and blue jets, side effects of thunderstorms that occur in the upper atmosphere and are typically only visible with high-altitude aircraft and satellites. The exact relationship between all these events is still unclear, though. RHESSI was launched in 2002 to study X-rays and gamma-rays from solar flares, but its detectors pick up gamma rays from a variety of sources. While scientists estimate a global average rate of about 50 TGFs a day, the rate could be up to 100 times higher if, as some models indicate, TGFs are emitted as narrowly focused beams that would only be detected when the satellite is directly in their path.